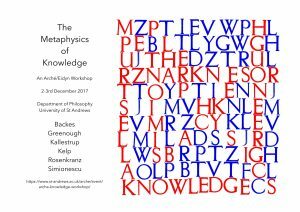 This is the second of two Arche/Eidyn workshops on the metaphysics of knowledge and justification. Abstract. The orthodox view of epistemic basing is that S’s belief that p is justified when S has justification to believe p in virtue of S possessing reason r (or evidence e), and S believes p on the basis of r (or e). While there are competing accounts, most prominently in terms of various causal conditions, of what basing amounts to, all parties accept that basing is non-fundamental. Moreover, if there are cases where S’s justified, true belief that p counts as knowledge, we can take r (or e) to be the basis for such knowledge. But proper basing is insufficient to convert true belief into knowledge, even if Gettier cases are set aside. For S’s doxastic justification may be subject to (other) types of epistemic defeat, or may simply fall short of the threshold for knowledge. Let’s say proper grounding is what turns doxastic justification into knowledge. We take grounding to be understood as a non-primitive partial order. The determination relation is a case in point, and a paradigm example of an epistemic ground is the state of epistemic seeing. So, while a visual experience as of p may count as the (causal) basis for a belief that p, seeing that p constitutes the (metaphysical) ground for the corresponding knowledge that p. Importantly, knowing that p and seeing that p are related as determinable to determinate. Against the backdrop of epistemic basing, this paper seeks to develop and defend a comparative account of epistemic grounding, which is both theoretically significant and explanatorily useful. This paper develops a novel account of knowledge. Traditional reductive approaches venture to offer a set of non-circular conditions for knowledge that are individually necessary and jointly sufficient. In contrast, the proposed account is non-reductive. Knowledge is analysed in terms of its place in a network of phenomena that can only be properly understood in terms of each other. More specifically, I argue that knowledge is the constitutive aim of inquiry and that this serves to shed light on the nature of knowledge. Finally, I show that this account is preferable to the most prominent alternative non-reductive account of knowledge on the market, due to Tim Williamson, according to which, roughly, knowledge is a kind of mental state. The paper explores a structural account of propositional justification in terms of the notion of being in a position to know and negation. Combined with a nonnormal logic for being in a position to know, the account allows for the derivation of plausible principles of justification. The account is neutral on whether justification is grounded in internally individuated mental states, and likewise on whether it is grounded in facts that are already accessible by introspection or reflection alone. To this extent, it is compatible both with internalism and with externalism about justification. Even so, the account allows for the proof of principles that are commonly conceived to depend on an internalist conception of justification. The account coheres both with epistemic contextualism and with its rejection, and is compatible both with the knowledge-first approach and with its rejection. Despite its neutrality on these issues, the account makes propositional justification luminous and so is controversial. Here are some some minimal desiderata for a normatively satisfactory account of epistemic justification: First, one’s account of justification had better drop out nicely from general normativity theory . Second, ideally, we want our account of justification to be generalizable to other normative domains – prudential, moral etc. – and to other targets of application – actions, other types of states etc. Last, the account proposed should exhibit minimal intuitive adequacy in normative respects. i.e. be able to account for intuitively distinct normative statuses. In the light of these desiderata, this paper (1) checks the normative credentials of extant knowledge first accounts of justification in the literature and (2) argues that a knowledge first functionalist account of justified belief does better than the competition in meeting the minimal normative desiderata identified.